The names of domestic violence victims were called and participants at the ceremony displayed each name on red heart-shaped signs. Guns were used in 67 percent of the killings. ANNAPOLIS, Md. — There were 46 deaths from domestic violence in Maryland between July 2017 and June 2018. 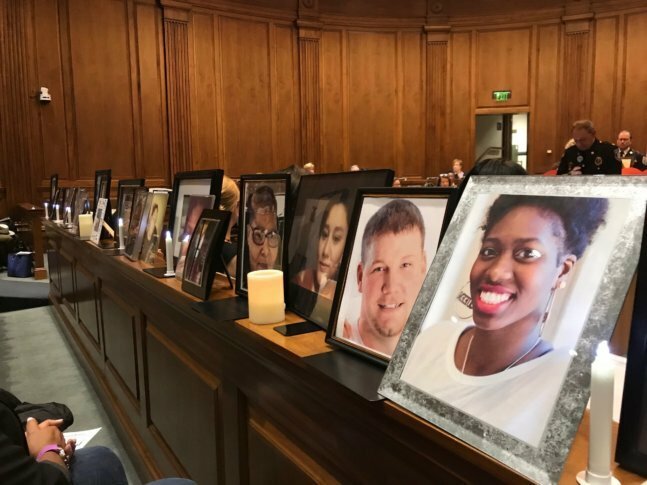 The victims were remembered in a ceremony Monday night, presided by Maryland First Lady Yumi Hogan. “As a mother and a grandmother, my heart breaks for the victims of these senseless tragedies,” Hogan said. The Maryland Network Against Domestic Violence says 26 intimate partners were killed, including wives, girlfriends, husbands and boyfriends. Among the dead were five bystanders, including off-duty Prince George’s County Police Officer Mujahid Ramzziddin who was killed when he rushed to the aid of his Brandywine, Maryland neighbor. Fifteen abusive partners died, 10 of them were men in murder-suicides. “What we know is that it can and does happen in communities all across Maryland regardless of socio-economic status, racial makeup and all other kinds of demographics,” said Inga James, president of the Maryland Network Against Domestic Violence. The names of domestic violence victims were called and participants at the ceremony displayed each name on red heart-shaped signs, which also indicated the victim’s cause of death. Guns were used in 67 percent of the killings. “This can happen anywhere. It can happen everywhere. It happened here,” said Senator Chris Van Hollen, D-MD. Van Hollen said it’s important to remember the victims of domestic violence and support survivors and the loved ones of the victims. The Maryland Network said the victims who lost their lives in the 12-month period left behind 35 children.